QUESTION: Let's begin with your time in the New York Public Service Commission, regulating the New York telephone company. How did you get started in this? ALFRED KAHN: In 1974, I was appointed by Governor Wilson of New York to the chairmanship of the New York Public Service Commission, which was responsible for the regulation of electric, gas, telephone and water companies. That was a period of double-digit inflation, and so we spent an inordinate amount of time simply hearing requests for rate increases from these various companies. We were certainly assisted in our efforts to deregulate by the very severe inflation that was occurring during the Carter administration, particularly where regulation had historically taken the form of restrictions on competition. It [was] possible to contend that if we would get the regulators out of the way that competition would reduce prices, and save consumers money. And that was given additional forcefulness and political attractiveness while the inflation was going on. It was not a coincidence that most of these regulatory statutes that we overturned were enacted during the Great Depression, when the main fear was deflation, and the major motive of regulation was to stop the downward wage price spiral. So altered circumstances became much more propitious to deregulating in the mid-1970s and late 1970s. QUESTION: For the New York telephone company, you went after the rate structure and the directory assistance issue? ALFRED KAHN: While we were directly regulating, the principal thrust was to getting rates more efficient. This was a period of concern not only about inflation but about a so-called energy crisis, and environmental protection. And in those circumstances, particularly in the electric industry, it appeared that we were underpricing - and encouraging consumption with declining block rates for example. So it became sensible to introduce economically efficient pricing, which would reflect those costs and discourage wasteful consumption. In the telephone industry, there were similar attempts to make this rate structure give users the right signals. For example, we differentiated the initial costs of setting up a call from the length of time spent talking. And that more closely tracked costs. That also had the virtue that it enabled us to not conceal rate increases, but when we had to give rate increases we could accompany it by a reduction, for example, in the number of minutes of time covered by the initial charge. And this is complex, but - I had written a two-volume work called The Economics of Regulation, which argued strenuously for marginal cost pricing. In the telephone industry it involved charging for directory assistance. We said, "Well, if you use directory assistance a lot you ought to pay for it." And those people who take the trouble to look it up in the phone book should not. QUESTION: What was the problem with airlines, and why was deregulation of airlines the big topic? ALFRED KAHN: There were several historical forces that made it possible for us to move essentially first in deregulating the airline industry. One was that the airlines had never been very profitable, that while regulation prevented them from competing in price, it didn't prevent them from competing by more greater frequency of flights. So that if you held the price artificially high, then they would schedule more flights, and with the result that the planes would still be less than half full. So even though the whole industry was opposed to deregulation, because they wanted the protection, and so did the airline unions - the fact is that they didn't do very well under regulation. That was sort of point number one. Point number two was that the industry had engaged in a binge of acquiring new jets and jumbo jets. You had the jet revolution in the 1950s, and the jumbo jets acquired in the 1960s. And with the economy moving into a recession in the 1974-1975 period, they found themselves with a tremendous number of empty seats. There was a very strong motivation on their part to try to offer discount fares in order to fill those empty seats. So that was propitious. All they really needed was for the government to get out of the way and say, "It shall not be illegal for you to give discounts." And once we did that, they began to - we had a flurry of discounting. A third propitious factor was the general inflation in the economy, and we were able to say that if you permitted people to compete - the essence of regulation was that it was protectionist - it prevented them from competing with one another. We were able to say if you would unleash these forces of competition it will be counterinflationary. And in point of fact, in the first year real fares, adjusted for inflation, went down 10 to 12 percent. So that was an additional factor. Airline fares are a big item. Consumers are very conscious of it. We could never have succeeded in deregulating trucking if we hadn't first done it in this very visible place, in which we could produce very visible results just by getting out of the way. But, as I say, it was counterinflationary, it was visible, it got headlines, and so I think those are the principal reasons why it succeeded there. QUESTION: You said that under regulation the airline company didn't do well and the consumers didn't do well. Could you explain that? ALFRED KAHN: Well, the airlines didn't do well for a lot of reasons. One, because the essence of regulation was protecting them from one another, it restricted them from entering any routes that they wanted to enter. It restricted them from leaving routes that were not profitable. They were totally inflexible on what they could do. The first airline that I visited executives [at], was then [called] Allegheny Airlines. And I said to them: "Start figuring out what you are now being forced to do by regulation that you don't think is profitable, and I'll let you drop it. And then start figuring out the markets that you think you would like to enter that you are being prevented from entering by regulation, and deregulation will see to it that you will be free to do so." Well, it was interesting, because Allegheny Airlines reacted almost in the most dramatic way of all the airlines once they were free: instead of dutifully delivering traffic to their hub at Pittsburgh on all the short routes, which are generally high cost because they are short, weather is bad and traffic is not very dense - they converted themselves into USAir and bought big planes that could then go across the entire continent. That freed them to configure routes in the interest of greater efficiency, as well as beneficially to the public - led to a vast adoption of both hub and spoke operations. Delta was the only one that had that before. And I remember I was asked to predict, "Well, what do you think the industry will look like if you get out of the way?" And I said, "If I knew what was the most efficient configuration of routes in the airline system, then I could continue to regulate. But since I can't tell you whether it's going to be a Delta kind of operation or it's going to be more like the Eastern shuttle, which is just back and forth, or Southwest Airlines, which was then just back and forth between Houston and Dallas, it doesn't make sense to leave it to an ignorant person like me to tell airlines how they can best configure their routes." And of course we got out of the way, and there was radical transformation in the industry, which told us what was the more efficient way to do it. So once we deregulated, even though it unleashed competition and it proved to be very, very painful to the airlines, especially in the early 1990s when they lost billions of dollars - the fact is that none of them wanted to go back to the protectionist days. QUESTION: Could you talk a bit about the role of Senator Kennedy's hearings in sort of helping to get this deregulation ball rolling? ALFRED KAHN: I think Senator Kennedy's hearings played a very, very important role, partly of course because it had the benefit of these historical forces that I have been discussing, the discontentment of the airlines because they are not making much money, the discontentment of the public because air fares were high, and here were all those beautiful seats. And Senator Kennedy's hearings dramatically exposed that. They also had the very useful function that the chairman was an old-time New Deal liberal who had very strong inclinations to regulate everything. And the other aspect of the old New Deal was, however, that it was very pro-competition, and very strong for antitrust, and in some sense against big business and against protecting big business. So when somebody like Senator Kennedy, an old-time liberal, found himself working with Consumer Federation of America, Common Cause, Ralph Nader's organization the Public Citizen, as well as agencies like the National Association of Manufacturers. It was an eye-opener that you could be an old-time liberal and consistently with that be in favor of competition, and that that would be beneficial to the public. So it was the other reason that the circumstances were propitious was essentially philosophical. The country was reacting against what it saw as an overly intrusive and inefficient bureaucratic state planning. A change which would seem to be producing inflation and endless deficits, and not giving benefits to the public. It was possible at that time at least to have the moves in the direction of what we later called the New Democrats, such as President Clinton exemplified. QUESTION: Who did well under regulation, and who wanted regulation? ALFRED KAHN: Well, the historical truth is that most of these regulations that I am describing, the kind of pervasive government restrictionism and prescription results, such as we had not just in airlines but railroads and trucking and telecommunications and electric power - if you look back historically you see that the prime proponents were the industries themselves and their unions. And that means it was in the interest -- not in the airlines, because they didn't do terribly well - [of] their managements. They had a relatively easy life. They enjoyed licenses which insulated them from competition and which had value. I mean, what's the value of a medallion for taxicabs in New York today? I think it's on the order of $150,- or $175,000. Now, the people who go into the taxi business don't benefit by it, because they have to buy the damn medallions. Taxicab drivers don't do particularly well. So it's the people who got the monopoly privilege and protections - and that includes the unions - wages of pilots, wages of Teamsters, have historically been far above levels that would prevail if you had competition. QUESTION: Is there a relation to this deregulation to getting us out of the stagflation of the 1970s, creating the more efficient economy of the 1980s and 1990s? 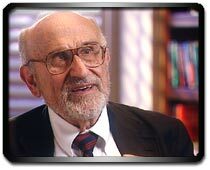 ALFRED KAHN: Once you gave companies the freedom to decide where they wanted to go and how they wanted to serve, what kind of equipment they wanted to use, and the freedom to vary their charges depending upon whether they were overfull going in one direction or had empty space for the backhaul. That was illegal under regulation - it was regarded as discriminatory. You know, an economist would tell you it was not discriminatory, because the margin cost of carrying more traffic when your trucks are already full is an additional truck. The marginal cost of carriage when you have empty space coming back is zero almost. Well, the restrictions permitting people to enter markets in competition with one another, thereby putting pressures on them for improved efficiency, giving them total freedom to configure their routes in the ways that seem to them most efficient - all of those promoted enormous increases in efficiency, as well as pressures of competition to push down theirs. It gave them freedom as well as it posed pressures on them to offer discount fares to fill their planes. And if one did it the other had to do it. And the end result was again load factors. The average number of seats on planes built in the decade before regulation was about 52 percent. Today it's around 70 percent. Now, that of course carries with it discomfort and crowding, and that's the price that you pay in order to have cheap fares. But, again, it is a more efficient use of aircraft. And exactly the same thing is true - there have been surveys in trucking which should that the percentage of backhauls that came back empty has gone down sharply, because you have an empty truck - you look around, and you say, Well, here's something I could pick up, or there's a city nearby that I can go to - that would have been illegal under regulation. QUESTION: Are poor service and overcrowding part of the price of deregulation? ALFRED KAHN: Service in the airline industry under regulation was quite good, at least in terms of the amenities - the empty seats next to you, the relatively short lines at the counter. Since the airlines could not compete in price, they competed in quality. The main reason that people like Senator Kennedy and populists and consumerists wanted deregulation and competition was that we wanted to bring air travel within the reach of people of modest means. And once we permitted competition in price, the airlines were no longer subject to rules that might say, "Oh, you can't have long lines at the counter." I mean, a real regulator would take a tape measure and measure the length of line at the counter. No, they introduced this new, admittedly less comfortable, crowded service. Instead of competing on the meals that they gave and free in-flight entertainment, under regulation, internationally, that was prohibited, because that was another kind of competition. So they actually regulated the size of sandwiches in the international routes. And they began to compete in the number of flights that they offered. Internationally, they'd restrict the number of flights. Just today, this very day, there is a big fight going on as to who may carry how many flights between the United States and China, and there are companies competing for it - Delta, American Airlines, United Parcel Service - because it is a valuable privilege because it's restricted. The one way in which the availability of discount fares - last year, 94 percent of all mileage was at discount fares. The average discount was 69 percent from the full fare. Now, the full fare was often I would say outrageous. The fact is that in real term the average fare has gone down something like 40 percent. That has changed the culture of flying - of course it has. It has made it possible for kids to visit their parents back and forth. We have an explosion in the amount of air travel. It has meant - you may put it in a favorable way, the democratization of air travel. You may put it in an unfavorable way, from a patrician standpoint. I mean, I had a complaint from a former student of mine who was very well to do about the hippie who was sitting next to him, unshaven. And he claimed he smelled. And I wrote back, and I said, "Well, I'm waiting to hear whether there are any complaints coming from the hippie." But of course a well-functioning competitive market offers people alternatives. A low-quality, low-price option and a higher-quality, high-price option for those people who want it. Well, originally the effect of this widespread offering of discount tickets and the reconfiguration of planes, the poorness of the service spilled over to people who were paying full fares. The airlines then, just as you would expect to happen in a good, competitive system, began to realize they had to do something to compete for those high-fare travelers. And the airlines, if you look at the advertisements internationally about British Air and others - TWA - are putting beds on planes, are setting up a business class. QUESTION: Could you talk a little bit about the Airline Deregulation Act of 1978, what it proposed? ALFRED KAHN: Well, effectively the Airline Deregulation Act set up phases, over as I recall five years, for the liberalization of restrictions on routes, on pricing. It's interesting that the extent to which it was opened on Day One led some airlines to make terrible mistakes, because a certificate had value previously, because entry was restricted, some airline executives carrying over the habits of thought of the regulation period ran in and began to grab up routes. Braniff - I have forgotten how many routes they rushed into, it may have been 30, it may have been 50 - thinking that it would be beneficial. Well, they expanded way beyond their capacity to do so, and within a few years they were bankrupt. Observe then that deregulation calls for a different kind of management, abandoning the thought patterns of the past. In any case, it provided for eventual total deregulation on route, entry and exit - nobody was required to stay anywhere - and total freedom of pricing. It did not eliminate antitrust scrutiny. It left with the Department of Transportation - what had been the Civil Aeronautics Board, which it abolished after five years - the same kind of authority as the Federal Trade Commission has for all other unregulated industries to prevent something equivalent to unfair methods of competition. The FTC never had the authority over the airlines for that, because it was regulated that authority resided with the Civil Aeronautics Board. It was transferred to DOT. So of course we continued to regulate with intensified application of the antitrust laws. QUESTION: What do you think the future of deregulation is for the American economy? ALFRED KAHN: I'll give you one example. The savings and loan fiasco was attributable in part to deregulation. We gave them freedom to raise their interest rates to compete for funds, to invest in whatever they wanted to invest in. The trouble is that we continued deposit insurance so that the government always stood by to bail out anybody who risked depositors' money in foolish ventures. If we were to do that, then we should have maintained bank inspection. We should have had variable premiums, depending upon the riskiness of their investments. So it was a mix of continued regulation stupidly administered for the new era and deregulation that resulted in real fiasco. On the other hand, I think there's no question that we're going to continue to move in the direction of deregulation wherever it seems to be possible. Observe the electric utility industry. Generation is clearly capable of being competitive now. If a fuel cell really becomes efficient, that's another way of generating power at the consumer site. Transmission and distribution cease to be natural monopolies. That may well happen, because technological progress is the enemy of natural monopolies. And it is also the most powerful force for deregulation. QUESTION: Let's talk a little about inflation. Could you describe the magnitude of the problem of inflation during the 1970s? ALFRED KAHN: The principal evils of inflation seem to be two. Each of them may be complicated. One is that it averts attention from efficiency, from careful attention to cost minimization. And in general converts us instead into a cost-price spiral. I think that's one. The second is more political and psychological and philosophical. There is something demoralizing to a country - to its people - to find that even though they get pay raises once a year, then to find for the next 364 days that the value of their money is going down and down and down. It creates divisiveness among classes, a tendency to cast blame on villains - on profiteers, or on evil labor unions. It's divisive of society. It also promotes a feeling - sort of justifiable - that the society is out of control, that we don't seem to be able to discipline ourselves. You can therefore understand movements such as, under President Ford, "whip inflation now," show restraint, or President Carter saying that if everybody stands up in the football stadium, nobody sees well. If we could all just get ourselves to sit down, we'll see just as well and we'll be more comfortable. Perfectly true. But a democratic society is not capable of doing that. And ultimately, the only way of exerting the necessary discipline is monetary restraint. And I remember having lunch with Paul Volcker, in which we had these guidelines and we were trying to persuade labor unions to limit their raise demands and businesses to limit their price increases. And I remember Paul Volcker saying to me: "Fred, that program is simply not working. I'm the only one in town who has a weapon that can be used, and sooner or later I'm going to have to use it." And I said "You're absolutely right, but it's very hard for a Democratic administration to do that - unemployment as a consequence." Well, that's what finally did it. The weapon was monetary restraint. Inflation is ultimately a monetary phenomenon. And every major inflation has typically been powered by increased government deficit spending, usually in wars, financed by expanding the money supply - whether just printing money or by selling securities to the central bank. And so ultimately, I remember what I said at the beginning: "If we don't bring inflation under control voluntarily" - I was a good soldier - "sooner or later, we're going to have a deep depression." That's when I got in trouble for using the word "depression." But sooner or later, people will be so impatient, that they will willingly accept the discipline at the cost of at that time the worst recession since the 1930s - that unemployment rates measured at 11 percent and probably 15 percent if you include the unmeasured unemployment. It's not purely economics, you see. I feel it's more psychological. QUESTION: Could you say briefly how you used inflation to help deregulate trucking and railroads? ALFRED KAHN: The situation in trucking and railroads was similar - with important differences between them - to the situation in the airlines. People were worried about inflation. Here we had a protectionist regime that prevented competition, that kept truckers from competing with one another. In one year - there's a study that showed that 95 percent of the pricing cases of the trucking industry involved controversies over price floors, and only 5 percent over price ceilings. Why was that? It was because some competitor came in and said "This guy is cutting rates, and you've got to stop him." Well, in a period filled with inflation, the most appealing thing politically is to say "I've got something in my pocket: a deregulation bill which will get the government out of the business of setting price floors. It will set off competition that will be counterinflationary." So I used my office - futilely in a sense at the macroeconomic level - to accomplish something for the microeconomic level, which, you know, I think had had some significant role in the recoveries and growth of the last 20 years - a role insignificant compared with the role of technology, a role insignificant compared with the role of Paul Volcker and Alan Greenspan. But a role. QUESTION: Could you talk a little bit on the role of the economist, on the role of social science in public policy? ALFRED KAHN: When President Nixon said "We are all Keynesians now," even though it appeared that the Keynesians' inability to practice the corresponding restraint, which is part of the Keynesian legacy as well when restraint is called for, I think that that does represent a genuine improvement that the economists have assisted. And I think the same thing is true of the deregulation - which by the way, in the case of the railroads, has brought reduced rates, but it's also permitted them greater freedom to increase rates. And that within limits has also been done officially, because the industry has been able to bring its capital, enormously improved the productivity of its workers, upgraded its tracking system, and so on. I think the role of the economist has been generally beneficent. On the other hand - what economist can go along without saying "on the other hand" - what happens tomorrow is never what you predicted today. And whether we economists will be better than anybody else in that is very difficult to know.